Once upon a time I had a RC car with a 3.5cc nitro engine. Lots of smoke and noise. I loved the thing, until it crashed into a sidewalk with 50 km/h… So that was many years ago and I haven’t had a toy car since. Now however there are interesting kits on the market which are fun to build and play with. 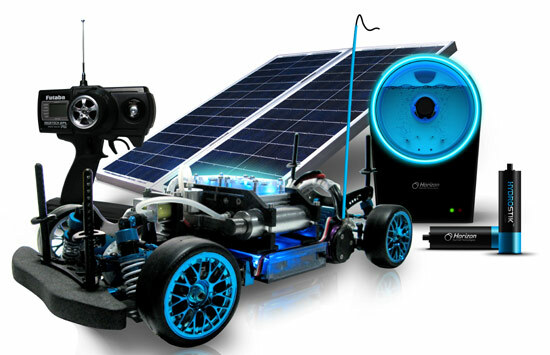 For example (solar powered) fuel cell toy cars. Horizon Fuel Cell Technologies introduced the H-CELL 2.0, an incredible fast RC car, which actually stores hydrogen in smal, battery shaped cartridges. These cartridges, called HydroSTIKS, can store 11Wh of energy. According to their website, this is enough for 2 to 3 charges for average mobile phones, or 1 to 2 charges of a 3G smartphone. You can charge these cartridges with a bit of water and electricity from e.g. a solar panel. …downside is, this toy costs about 500 bucks. 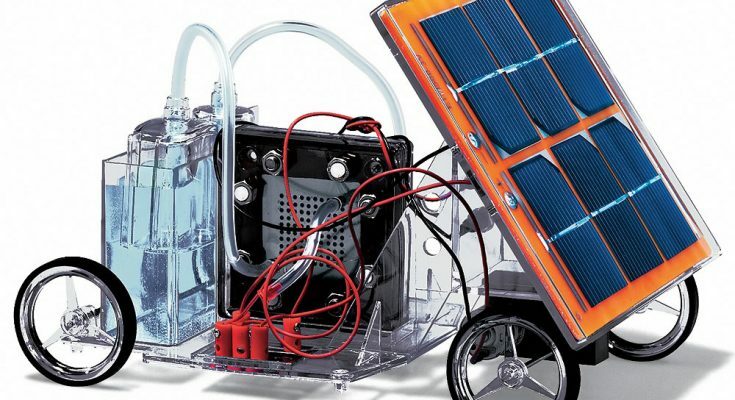 So you might start with a more simple and cheaper kit to understand the basics of fuel cell technology and to have some fun too. 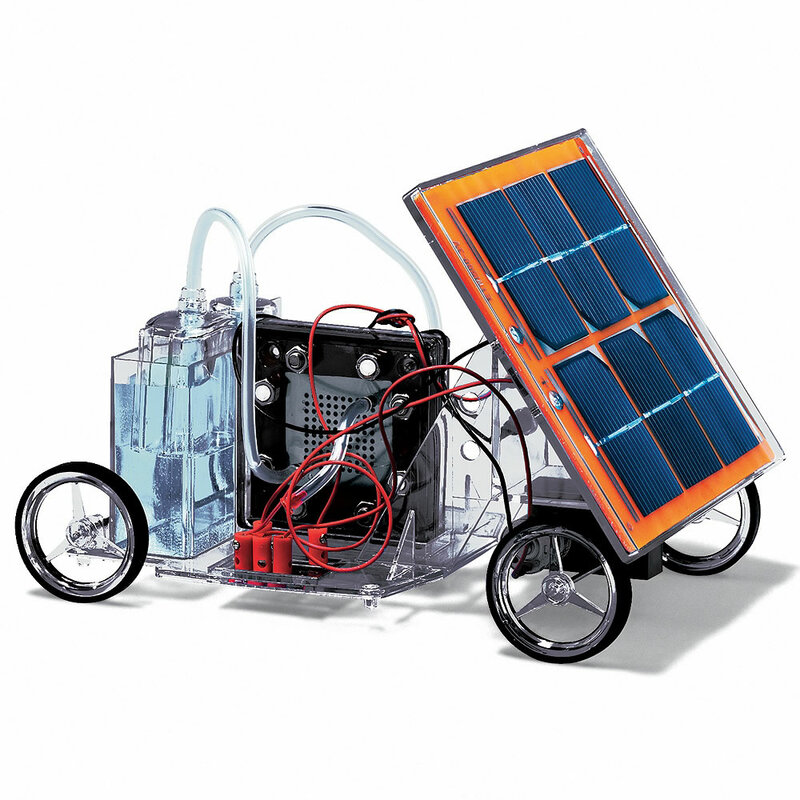 Fuel cells combine oxygen with hydrogen to produce water and electricity. Result: energy & little pollution. For more info on the working of fuel cells, I recommend reading Wikipedia’s article about fuel cells or read these fuel cell basics on this webpage. Where to buy fuel cell toys? 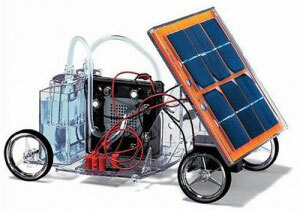 If you want to DIY your own solar powered toy car, check out: make your own solar powered toy cars. this solerpower car is good I wish i had one of thoes i go to coconot crek elementry school have a good day!! !